Dumbbells are one of the most versatile and accessible pieces of equipment found in a gym. Do you remember the famous tag line, “if you’ve got a door, you’ve got a gym”? Well, the same thing applies with a set of dumbbells. 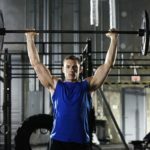 Not only are they extremely practical, they can be seriously effective in building muscle, increasing strength and enhancing overall conditioning. They allow for a greater range of motion during exercises, add negative resistance to your training, and ensure your body remains in balance by making both sides work independently. Step forward and lower your body until your front knee is bent 90 degrees. Step on a raised platform by extending the hip and the knee of your right leg (this could be a step on a staircase or anything sturdy). If you would like to learn more about these types of exercises and increase your overall health and fitness knowledge, check out our Cert III and IV in Fitness.